Nikhil Goyal: Author and International Speaker on Education. 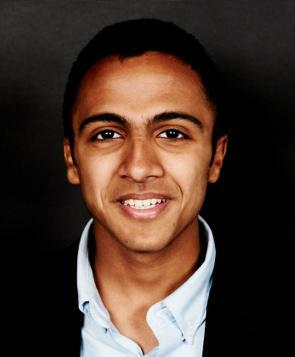 17 year old author of ‘One Size Does Not Fit All: A Students Assessment Of School’, one of Forbes 30 under 30 and nominated by Diane Ravitch as ‘A future secretary of education’, Nikhil Goyal has become something of a spokesman for the millions of young people around the world who are, day by day, repressed by traditional schooling. Nikhil has already been outspoken in his criticism of standardized tests, rote learning, authoritarian schooling and other, literally, ‘old school’ methods. So I tried to focus more on the solutions to problems rather than the problems themselves, though we did touch on them at the beginning out of our necessity. 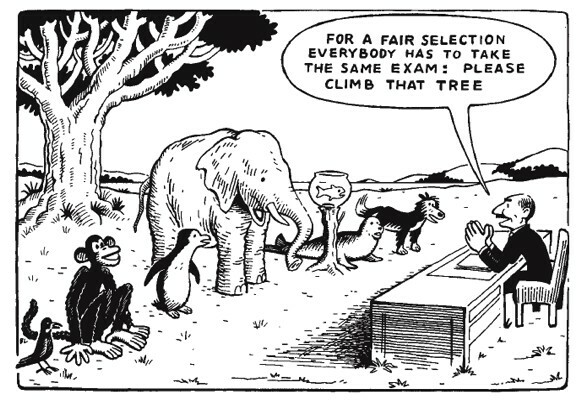 Nikhil’s stance on standardized Testing reminded me of this cartoon. So what would Nikhil’s ideal school look like? And what’s an average day going to be like for its students? He went on to advocate that class rooms be redesigned in the image of “sleek and collaborative” workplaces at creative companies like Apple and Google . “There isn’t ever going to be a normal day”, says Nikhil. Not a bad answer. So how is the change going to come? From within educational institutions, from a change in legislation, or by replacing the old system with new ones? Just as much as the current education system focuses on ‘one right answer’ at the expense of creativity, says Nikhil, there is no one right answer to solve it. So in summary, what, in his own words, would Nikhil change? So how do we fund this learning revolution? Nikhil is currently working on launching a non-profit organization called ‘Learning Revolution’, he plans to rally students to boycott standardized tests and protest against the repressive education they are being subjected to. Nikhil is an inspirational young person and while there are few seventeen year olds who have published books on their education system, he is not unique in his ability to articulate criticisms of it and seek improvements. Before Christmas I spoke to a diverse group of High School (or ‘Secondary School’ as we call it here in Ireland) students on their experience of school. Across the board they said they had never been asked for their opinion on school or invited to imagine their own ideal learning experience. The younger kids spoke of being frightened to ask questions lest they be made fun of by their teacher for not knowing something, and everyone wished that the learning was more practical, less restricted to the classroom bubble and more involved with their local community. I could go on and on but really those conversations deserve a post of their own. The point is that a random sampling of Irish students voiced many of the same complaints that Nikhil has and from my own personal experience I would say that there is a vast segment of the student population dissatisfied with their own current experience. The question is, how do we give these students a voice and empower them to re-imagine their paths to personal fulfillment? Right now I’m considering the possibility of setting up a social networking platform for students and educators to collaborate on in order to redesign schools and learning experiences for the benefit of all concerned. What do you guys think? Please let me know in the comments, and share this along if you found it useful, thank you. we are caught between a ‘pragmatics’ education system , and a so called digital revolution. Most of education is built on the back of technological Industry and what it demands in skilled workers informs the educational system and pays for it also. Maybe these days you can , in Ireland add – pharmaceutical, IT , sciences. All young people should have some all round base to what they are exposed to – there is so much you cannot know you are ‘good at ‘ – without first being exposed to learning , getting tasters . Who knows the myriad of occupations to be had with a good grasp of biology or geography? Who would associate the range of degrees and specializations that are available from those two subjects at Third Level? It is not marketed well enough as it is, and not contextualised efficiently enough to excite young people or engender confidence and curiosity . I think Education is about creating curiosity in young minds, teaching them how to ask questions without being afraid of looking stupid and allowing them to say – Why : I don’t understand yet. Finding new methods and new ways to discourse in a classroom setting could help. Round table class structures improved a UK classrooms total understanding of a particularly difficult text in one instance , along with use of the Internet for supportive literature. – and I MUST look up the school as it featured in an Observer weekend as having a headmaster with a ground-breaking new approach to supportive learning! Hey Anna! Thanks for the comment. I agree with you on most of what you’re saying there. I don’t think young people are afraid to ask ‘why?’ when they don’t understand something. Not until we teach them to be afraid, and unfortunately that’s what’s happening in schools right now, there’s a rhetoric of valuing questioning things, creativity, critical thinking and open minds etc, but in practice all these things get you in a lot of trouble in our schools. That’s no accident, one of school’s main jobs is to produce obedient and reliable cogs in a machine; whether or not that machine is good for them or their community. My high school’s administration has recently decided to enforce a new “standardized grading system”, basically meaning that our grades for each subject are now based wholly on final test results. Even before this change I had ideas and opinions along the same lines as Goyal on our education system. My community’s schools especially are sinking deeper and deeper into the problems Nikhil talked of, while its students are experiencing a severe lack of creativity, passion, and curiosity. I’m writing an article for my school’s newspaper on the standardized grading systems, and this interview gave me some new ideas! Thanks!